There are a number of specific areas that need to be taken into consideration when setting up a classroom for a student with ASD. The diagnostic criteria for ASD includes social, communication, sensory, behaviour, cognitive function and motor skills. Each child is individual and will need different accommodations depending on how the child is impacted by ASD. Often people don’t realise the importance of putting these things in place up front. We wait until there is a problem. When strategies are put in place at the beginning of the year, there will be fewer problems and a better settling in period for the student. · Lining up – have a set place in the line or partner to line up with. When there is free choice as where to line up this requires social skills and problem solving which can be difficult for the student with ASD. By having a set place at the start of the year this will ensure a smooth start to the day. · Position in Classroom (seating, mat time, assembly, parades) – have a set position for the student which takes into account who they are next to, where in the room or group, how close they are to teacher, distractions (ie too close to favourite activities like books, computers, Lego etc), sensory distractions (noises, smells, lighting, objects hanging too close). Some students prefer to be near a door so they can leave if anxiety is building (particularly in secondary). · Bags/Lockers/Tote Boxes – ensure these are at the quiet end of the row. Students often don’t like being touched or crowded or the noise that happens in the busy areas. For some students it may be best to have it in a completely separate area. (For some secondary have a separate classroom, area in library or outside staffroom to ensure the student has calm transitions between classes.) In primary sometimes the organisation skills required for a tote box are too hard, they are best with a book box where they can easily see their books standing up. · Writing – 60% of students with ASD have dysgraphia. This means handwriting can be messy, slow or avoided, especially as they get older. You will need to consider allowing iPad, computer and other forms of technology as their mode of work. In the younger years pencil grips can support handwriting skills. · Reading – be aware many students have hyperlexia where they can decipher written words but do not comprehend what are they reading. · Organisation – ASD students often find organisation of their school equipment very difficult throughout all years of schooling. Limit the number of books, equipment etc. In primary school they are better with their own pencil case than communal pencils that are placed on the desk. In secondary school limit the number of items in their pencil case as they tend to lose items and it is harder to find individual items if there are too many to look after. · Partners/Group Work/Teams – have set partners, groups and teams pre-selected by teachers as when students self-select it tends to be by friendship. This nearly always leaves the ASD student last as for by the time they process the instruction and select someone it is too late. You also risk them selecting inappropriately which can result in behaviour. When selecting a partner consider a student who is a good role model and who will support the student. · Quiet Area – ensure there is an area the student can retreat to if they are feeling overwhelmed. This can be a quiet table, reading corner, outside classroom in hallway, alcove, office etc. Some students also need to be placed near a door in the classroom or assembly as they need a perceived escape route. 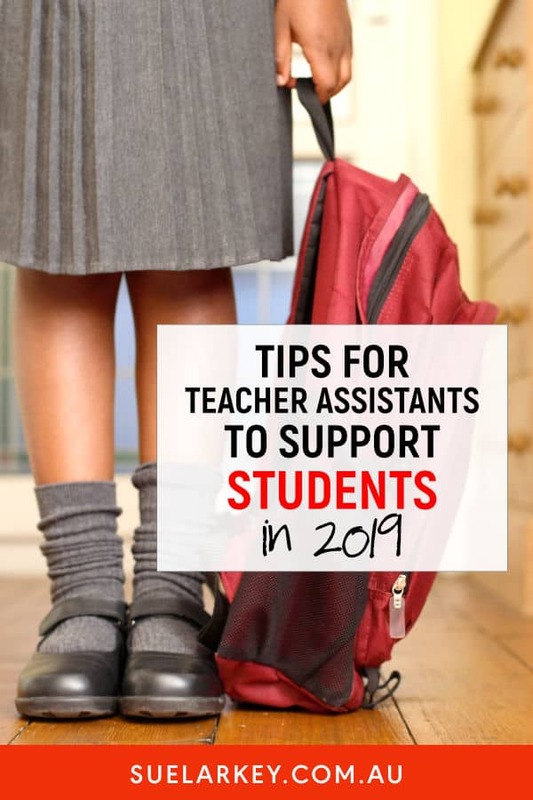 · Teacher Assistant/Education Support Officers – consider how best to use support time effectively in the first few weeks. You may need them to make additional support materials, schedules, visuals, social stories, organisation etc. See Cardinal Rules for Assistants in Teacher Assistants Big Red Book of Ideas page 12. · Changing Environments (going to specialist classrooms, changing subjects, going to assembly etc) – this is a high risk time for meltdowns as change creates anxiety for an ASD student. This is where having a timetable/schedule is vital as it pre-warns them about the upcoming change. If it requires lining up have a set place in the line or let them go to the door first or be your helper so you can keep a closer eye on them. Make sure all staff have a copy of the student profile (download from www.suelarkey.com) and introduce them before, if possible, to the different teacher. · Schedules /Timetables – these are VITAL no matter what age. This may be in a range of formats such as photos, visuals or words. Send these home ASAP. · Recess/Lunch – make sure they know boundaries, days on equipment, where to go with a problem, safe places, when library is open, clubs they can join etc. · Toilet/Drink – many students with ASD will not access these at the same time as other students. It is recommended you send them out during class time to the toilet and get a drink as this can impact on their learning. BE AWARE they may not ask you to go the toilet. You will need to send them. · Sensory Tools – many students require sensory tools to focus, process or calm. You will probably need to provide a range of sensory tools for the student. This may include a sensory mat to sit on, fidget tools, chewy necklaces, tubes or pencil toppers.